At Belvedere Seniors Living, we recognize employees as the most important resource in our organization. We are committed to ensure that all staff are treated fairly, their successes are recognized, and their professional growth and development is encouraged and supported. 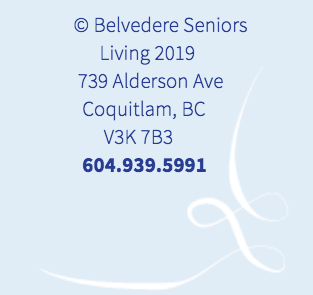 Our success in our commitment of mutual respect is reflected in the numbers of long service employees currently employed at Belvedere Seniors Living. Respect, Compassion and Commitment – inspire our philosophy and mission statements and govern all aspects of our organization, including our hiring practices and guidelines. Together, our values, philosophy and mission statements provide staff with clear guidance with respect to our residents’ care and inform the expectation that everyone works together to promote resident well-being and safety. A strong emphasis on teamwork is fundamental to our hiring strategy. We also maintain an open door policy for all staff that helps support them with successes and challenges in their work. Employees report that they can work in a responsible, efficient and effective manner within a cooperative atmosphere where there is a clear understanding of the goals and objectives of the organization. We support and encourage employee participation in setting out corporate goals, objectives, and strategies.